Nazi zombies. You have to admit, it is a heck of a combination. 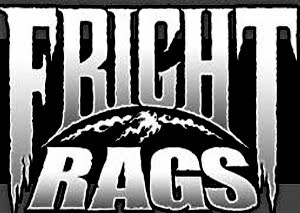 They must be the sort of thing that gives Indiana Jones nightmares, well, that and snakes. While there are not a whole lot of movies in the sub genre, there are enough people who thought it was a good idea for it become a thing. This is probably a good thing. Sure, there are some neat ideas and things you can do with a Nazi zombie, but it is still a limiting exercise, albeit one that has had renewed life in recent years with the Outpost and Dead Snow films. Still, when it comes right down to it, one of the best is also one of the first, Shock Waves. 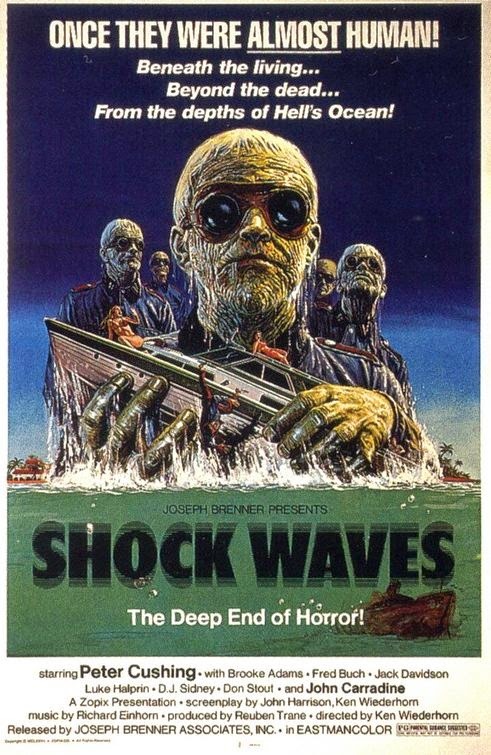 Shock Waves is a low budget Nazi zombie film that was released way back in 1977. The movie was co-written and directed by Ken Wiederhorn, who would go on to direct such films as Meatballs 2, Return of the Living Dead Part II, and Eyes of a Stranger, along with a few episodes of Freddy's Nightmares. For my money, he never topped his first feature. Shock Waves is horror on a budget done right. It is a movie that is creepy, atmospheric, and, while a touch dated, highly effective. It is also funny because it seems to succeed almost in spite of itself. Much of what was shot (or left out) was done so out of necessity, like it taking place primarily during the day (night shoots are difficult and cost more). As the movie begins we get a voice over telling us of super soldier experiments performed by the Third Reich. A result of these experiments were soldiers who were unbeatable, could adapt to any environment, and were made from dead soldiers. Once that exposition is out of the way, we jump to the present (well, the present of 1976, when this was shot). We pick up with a group of vacationers out on a dive boat. 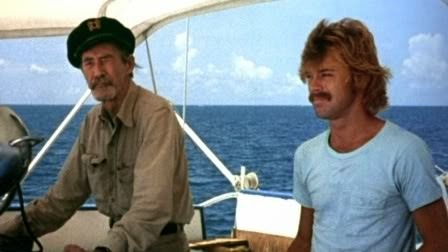 They are a particularly mismatched group as they complain about the captain (John Carradine), try to make conversation with the sailors, and typically act like vacationers. During their trip, the sun plays a trick on their eyes and takes out their compass. The end result is them running against an old, rusted out shipwreck. This forces them to row to a nearby island. This leads to a seemingly abandoned hotel, with its lone inhabitant (Peter Cushing). Shock Waves is a rather simple film. It gives us a gathering of potential victims, it puts them in an isolated location, introduces someone who knows something of what's going on, and it unleashes its evil upon the potential victims. The great thing is that it builds up this creepy vibe with minimal onscreen violence and no blood. Don't get me wrong, I love those things, but it can be done without. This is a PG rated horror movie that delivers! The zombies are rather unique in that they are not the familiar Romero zombies. These guys were an uncontrolled experiment, designed to live underwater. Watch them rise from the depths. Watch as they work as a unit, while never uttering a word. They are not rotting flesh, although age has had a little effect on them, they are intelligent, and seriously creepy. Shock Waves is a lot of fun. Sure, it is not perfect, at times it feels like there are scenes or lines missing. However, the movie still works. I loved watching the Nazis rise from the water or sink into the depths with their weird looking skin and distinctive goggles. Also, the scene where Brooke Adams' Rose character goes for a swim, the reflections on the water have a seriously eerie feel to them. 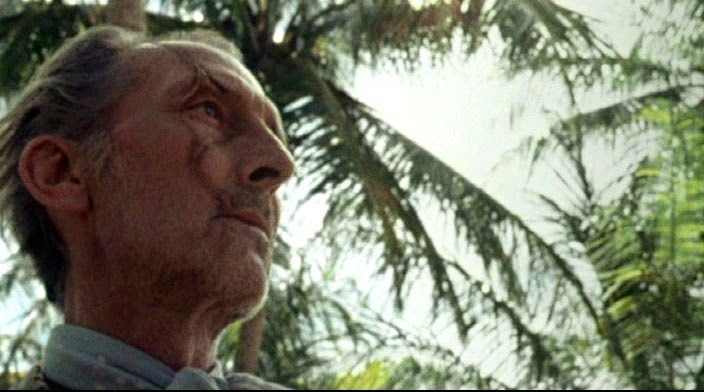 Then there is Peter Cushing, every moment with him is gold, even his abrupt departure. If you are looking for an interesting film that manages to creep without needing blood, this could fit the bill. It also seems like a good idea for updating/remaking (yes, I said it). There are some very interesting things about this that open doors of possibilities involving this undead Nazi zombie killers. I recently attending a screening of the remastered version of the film and it has never looked better. Yes, it still looks old and low budget, but it is still great. As an added bonus, Ken Wiederhorn was in attendance and had a Q and A after the film, moderated by Fangoria's Michael Gingold. It was pretty interesting as we learned that he is not a horror fan, but this was his opportunity to direct. He wishes there were more passes at the screenplay, and it was interesting to work with Carradine and Cushing, the latter of which advised on how to get some shots. It was an inside look at the development of low budget film making. It was great that he was there for this. Plus, he signed posters for all in attendance (while sitting at a table next to Maniac director William Lustig! ).